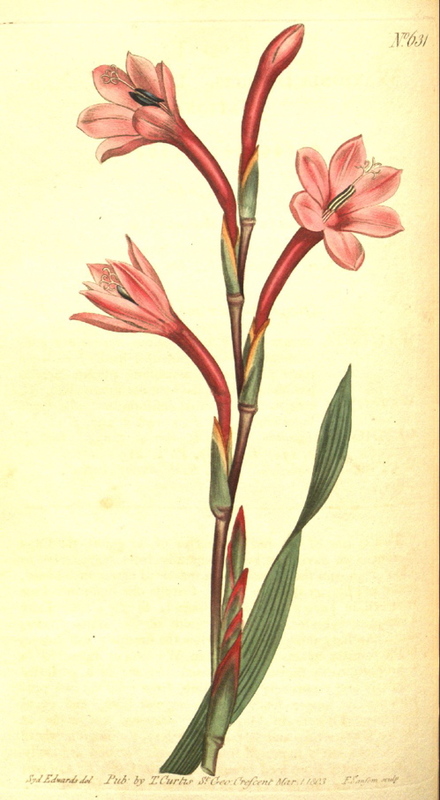 Hortus Camdenensis | Watsonia humilis Mill. Cormous perennial with sword-shaped leaves and usually unbranched spikes of up to 12 tubular flowers, white with pink outside or pink with darker pink outside, in spring or summer. To 30cm. [RHSE, CECB]. ‘This is one of the smallest species of its genus, the Cape specimens we have seen being generally from eight inches to a foot high and the leaves about the third of an inch broad, linear and shorter than the stem. […] Flowers in May. Our drawing was made at Messrs. Grimwood and Wykes’s Nursery, Kensington, where it had been lately imported from Holland. Raised originally in this country from seed brought from the Cape, by Captain Hutchinson, to Miller, in the year 1754.’ [BM t.631/1803]. 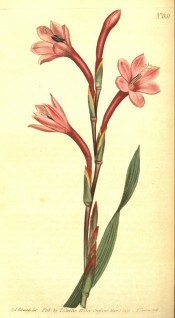 ‘If the beauty of the three plants we have here offered to the public, should not be thought a sufficient excuse for giving more than one variety of a species; we might add that, in our opinion, the acquaintance with the remarkable modes of specific variation, is as essential to a complete knowledge of vegetables as any other party of their history.’ [BM t. 1195/1809]. Listed in all published catalogues [B.445/1843]. Received per ‘Sovereign’ February 1831. [MP A2948].